21 Submissions were received this year, 11 shortlisted for oral presentation and 10 for poster presentation. We are delighted to be able to publish the 2016 Core Topics Meeting Programme. The educational programme has been designed around the feedback received at the 2015 meeting in terms of format and content. RCoA CPD approval has been awarded. Thursday afternoon sees a new focussed clinical update session addressing core areas of CPD for the general anaesthetist such as obstetrics, an update on hip fracture anaesthesia (SNAP2) and anaesthesia for amputation surgery. On Friday will be the ever popular Harold Youngman Trainee Prize session and after a successful inauguration at last year’s meeting the FOAM Film Fest @FOAMfilmfest returns. President of the Royal College of Anaesthetists, the East of England’s own Liam Brennan @drgas51 will be speaking on Friday afternoon on Morale & Wellbeing, a very fitting subject for the trainee-focussed day of the meeting given ongoing issues around the junior doctors contract. Trade support is already being pledged and we hope this will be another successful meeting. Registration is now open; see the programme and registration pages for details. Service improvement project: Moving from intraoperative IV to preoperative oral simple analgesia in day surgery. Day procedure survey: Self care post discharge at NNUH. Unforeseen benefits of introducing an enhanced recovery programme for elective caesarean delivery on the timing of day of discharge following emergency caesarean delivery. The Harold Youngman Prize is open to all medical students, FY doctors and non-consultant grade anaesthetists in the East of England. If you have an anaesthesia related project please consider entering it. If you are a college tutor or educational supervisor look out for projects your trainees are conducting – with a little encouragement they could be winning the 2016 prize. Dr Benji Marriage will be giving a talk on the Friday afternoon of this year’s EAAA Core Topics and Harold Youngman meeting on the subject of FOAM and innovations in medical education. 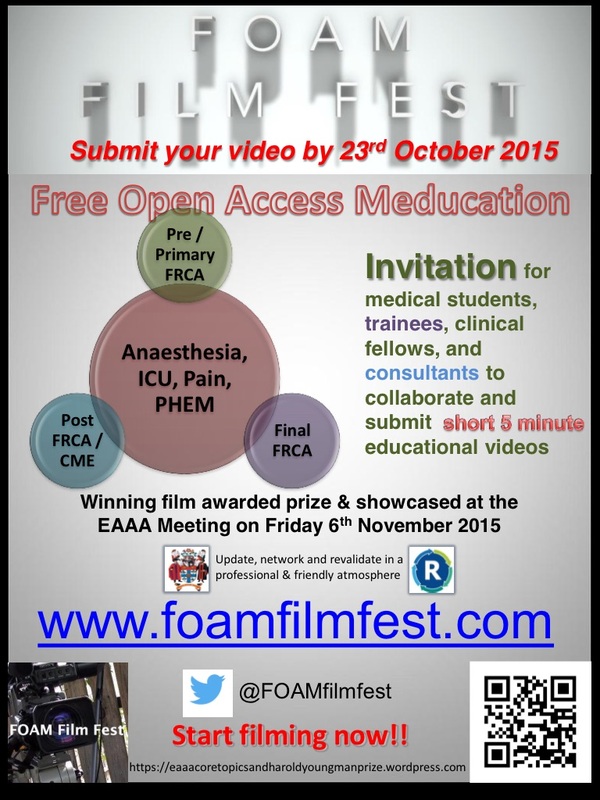 If you haven’t heard of FOAM it stands for “Free Open Access Medical Education” – sign up now for the meeting to find out more! As part of his talk Dr Marriage will be awarding the inaugural FOAM Film Fest prize, the first-prize winning video will be presented and is supported by a £50 prize from the EAAA. Full details of the film prize are available below or at the FOAM Film Fest website. The closing date is 22nd October so start planning and making your videos.